A great deal of scientific research demonstrates that air pollution exposure can lead to harmful health effects related to the lungs and heart. More recent studies show that air pollution can have harmful effects on the brain. Studies over the past two decades suggest that air pollution exposures are linked to harmful effects on the brain. These studies compared children living in Mexico City, an area with high air pollution, versus those living in less polluted regions of the country. Poorer performance on standardized psychological tests. Mexico City has high outdoor pollutant levels, but it is not clear what pollutants, or other factors, might cause these health problems. 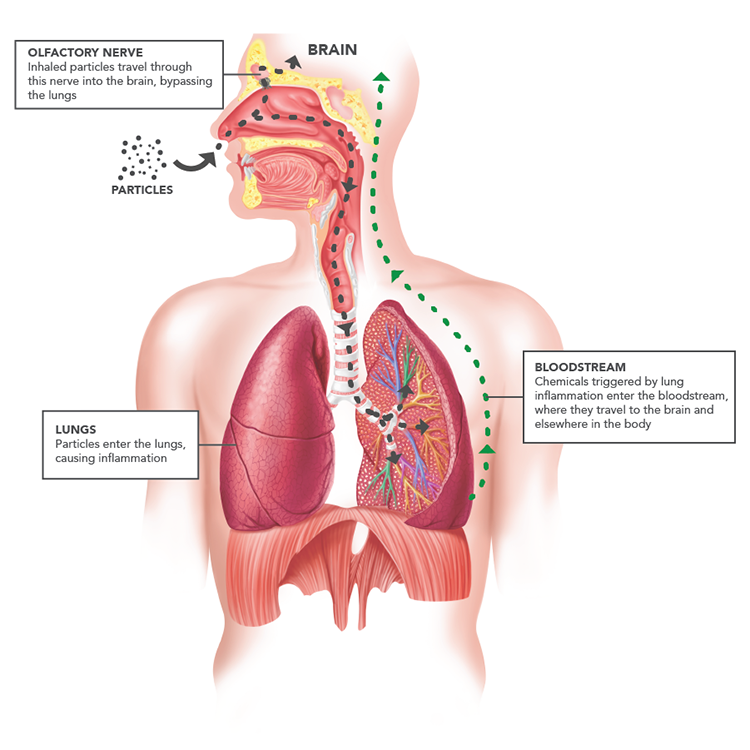 Can air pollutants enter or affect the brain? Chemical markers of brain inflammation can increase. Thus, air pollutants can affect the brain directly and indirectly (see Figure 1), and are associated with potentially harmful effects. These findings strengthen the case for inhaled pollutant-related brain impacts. Can air pollution affect cognition and brain disorders? Behaviors resembling human anxiety, depression, and impulsiveness. Research findings about associations between air pollution and negative effects on the brain are just beginning to emerge, so we cannot make definite conclusions at this time. In the meantime, CARB continues its efforts to reduce air pollution exposures, to protect public health for all Californians. What research is CARB doing In this area? CARB is currently involved in research investigating associations between air pollution exposure and harmful effects on the brain. For a list of completed and current health-related research projects, visit CARB's Research Projects Catalog.